The beautiful red sky this am foretells the rain tomorrow. I went on a solo walk this am as I didn't see the others. I did meet a number of people in the road each saying HI to each other. 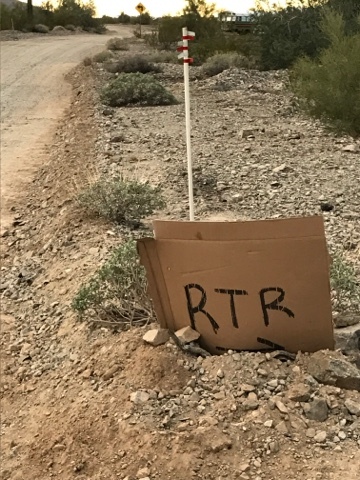 Above is a picture of our first RTR sign before the more proper sign below. The handwritten sign is kind of informal as is the whole gathering. 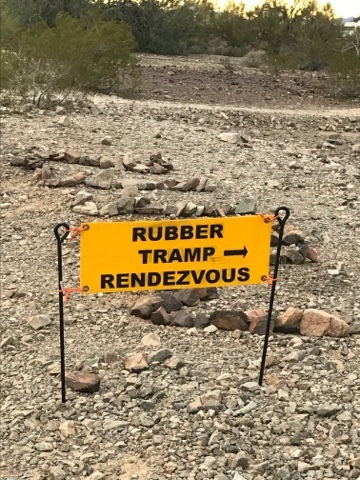 The entrance to the land we use for the RTR had a high brim as the mine up the road graded the road Monday as I came in. I dragged the bottom of the Prius in and out. Bob elicited volunteers with tools to taper the brim solving the problem for the estimated 300-400 attendees. Just up the road a short distance is a group of Schoolies. 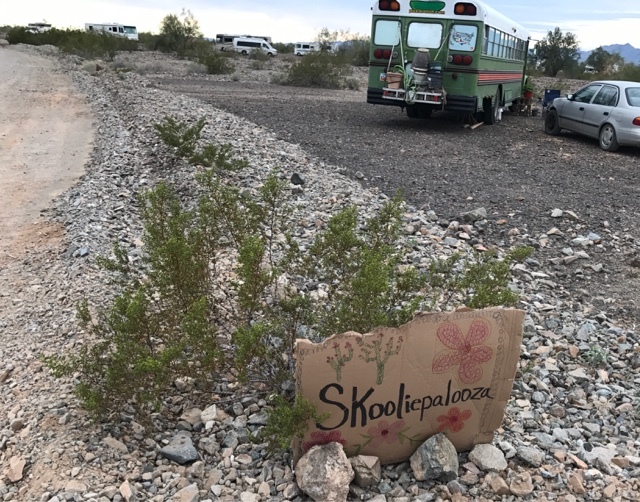 The sign says Schooliepaloosa. 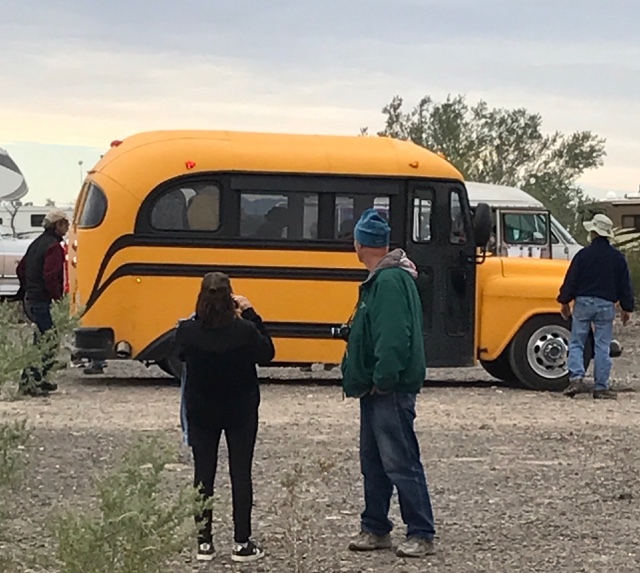 Here are a few of the busses. This old minnie schoolie broke loose from the pack and drove through the area near the main RTR gathering point. Above is the morning gathering as is done each day. After general announcements there was a seminar on safety as a vandweller. Again I had a busy afternoon with many visitors who are blog followers that I have never met wanting a tour of my Prius modifications. I am overwhelmed by the number of people that have followed my blog and have become inspired by this mode of travel. David with his green Prius parked next to me are fielding questions all afternoon. One couple came by and wanted to know all the detail and was very interested in my designs. I think the male was more driven by the Prius modifications and the woman showed greater interest with my rice cooker and how I store hot water to have it available all day and night. I had some return visitors too, the woman who has a Prius but the hybrid battery failed before she came out. She used a van in place of the Prius and spoke with Dave about aftermarket batteries as he has this experience. Her sister also came out in her van and left it at the RTR while they went in first woman's car. 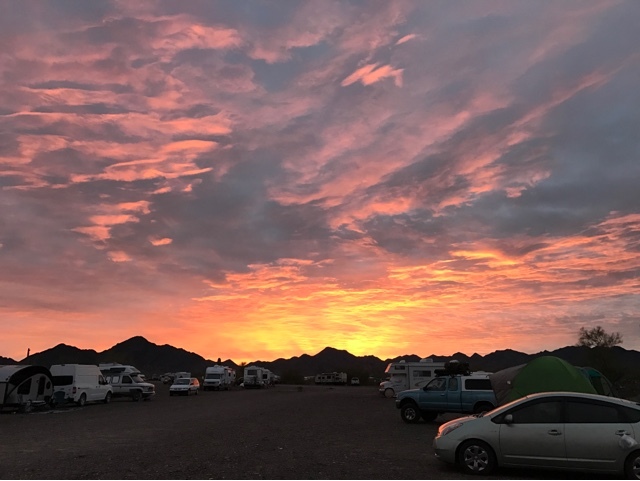 They went to Quartzsite and while there the sister lost her van keys. They told me and I offered to break into her locked car (experience I have from working on FD) and they accepted. After she brought me a coat hanger I was in and although she didn't have a key she was happy to have her things and a place to sleep. I moved on now looking for another vandweller that arrived that I know and they couldn't articulate their location. This brought me to a woman and her friends I met yesterday. Then they asked me to stay for food but it was getting dark and I had EMT brought my flashlight so I took my leave headed back to my site. On the way I got an invite to a friends campfire so I took the offer and met some new people. 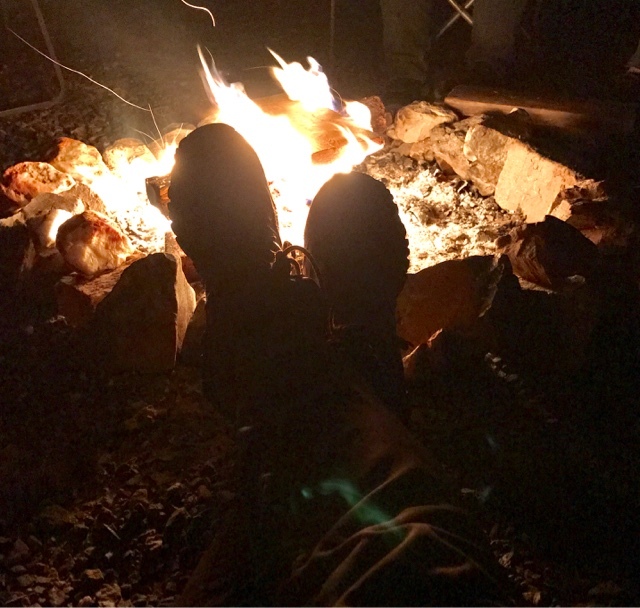 Here my feet are warming by the fire I was invited to and enjoyed the company of some new folks with some diverse backgrounds. 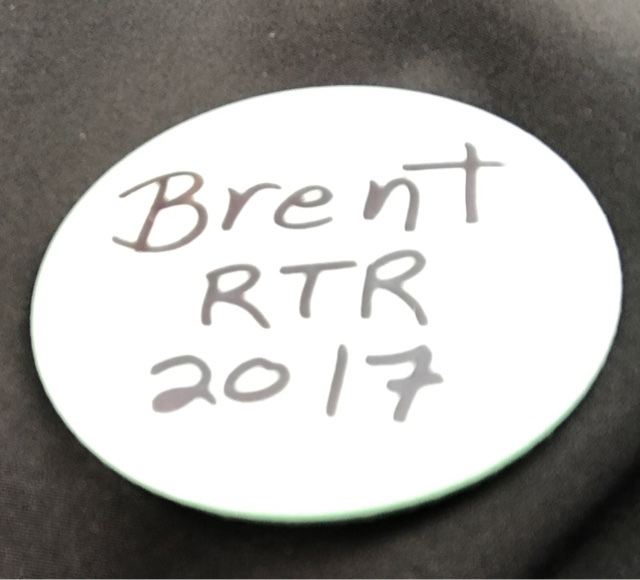 My name pin for the RTR. This is a first since we are getting so large as a group it helps.